L = Ф/I where Ф is the magnetic flux (in weber) linked with the circuit when a current I ampere flows in the circuit. 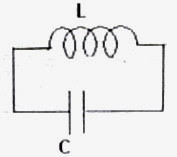 L =ε /(dI/dt) where dI/dt is the rate of change of current in the circuit. L = – ε/(dI/dt). But remember that self inductance is a positive quantity. It is the electromagnetic analogue of mass (which has the property of inertia) in mechanics. [Induced voltage (emf) is represented by the symbol V also, instead of ε]. UL = ½ LI2, which is stored in the magnetic field established by the current. L = μ0n2Aℓ where ‘ℓ’ is the length of the solenoid, ‘A’ is its cross section area, ‘n’ is the number of turns per metre and μ0 is the permeability of air (or free space). Note that the self inductance is proportional to the square of the number of turns. M = Ф/I where Ф is the magnetic flux (in weber) linked with the secondary circuit when a current I ampere flows in the primary circuit. M = ε /(dI/dt) where dI/dt is the rate of change of current in the primary circuit. M = – ε /(dI/dt). But remember that mutual inductance is a positive quantity. M = μ0nNA where 'n' and A are respectively number of turns per metre and the cross section area of the solenoid (primary) and N is the total number of turns in the secondary coil. [If the secondary coil is inside the solenoid, the cross section area of the secondary coil is to be used in place of A]. M = K√(L1L2) where K is the coupling coefficient which can have a maximum value of one. This happens when the entire magnetic flux produced by the primary is linked with the secondary. Note that self inductance and mutual inductance are directly proportional to the permeability of the core material. If a coil is wound on a core of relative permeability μr, its inductance will be μr times the value with air core. Further, the self inductance of a given coil (with a given core) is a constant where as the mutual inductance between two given coils depends on the relative disposition of the coils. I = I0(1– e–Rt/L) where e is the base of natural logarithms and I0 is the final current (at infinite time) given by I0 = V/R, where V is the direct supply voltage. 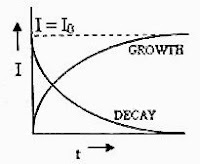 The growth and decay of current are shown in the adjoining figure. Q= Q0(1– e–t/RC) where Q0 is the final (maximum) charge equal to CV w hich is attained at infinite time. 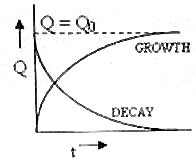 The growth and decay of charge are shown in the adjoining figure. L(d2Q/dt2 ) + Q/C =0. or, d2x/dt2 = –ω2x, where ω = √(k/m) is the angular frequency of mechanical oscillations of the spring-mass system. In the next post, questions (involving inductance) of the type you can expect in AP Physics C Exam will be discussed.